The cross country Maple Leafs hosted their only home meet on Saturday in the Goshen College Hokum Karem. This race is run by dividing teams into pairs who alternate running one mile loops, and the results come from scoring the top three pairs of each team. On the men’s side, Goshen College won the event over Grace College and Holy Cross College by finishing the event with 11 points. The Lancers and the Saints ended up with 19 and 24 points, respectively. The individual champions were Holy Cross’ runners Jack Reilly and Patrick Yerkes with a time of 50 minutes, 28 seconds (50:28) over ten miles. As for the Goshen runners, sophomore Isaiah Friesen and senior Jordan Smeltzer finished up in 51:02, which earned them second place. Junior Lucas Harnish and sophomore Daniel Klink, collected fourth place with a time of 51:47 and junior Tim Lehman and sophomore Luke Graber came in fifth with a 52:20 mark. Friesen was happy with the team’s performance but also with the performance of some of the injured athletes. “Jordan Smeltzer and Luke Kaufman are moving steadily back toward full strength after struggling with injury all last year, and many of the rest of us are in much better shape than last year,” he said. Friesen believes that this team is capable of doing great things this season. “I feel boundless optimism about this year’s team. We have a great deal more experience, more depth and better leadership than last year,” he said. As for the women, Grace College team beat out the competition with 10 points, followed by Goshen College, with 14, and Holy Cross, with 30 points. Ali Hochstetler and Mollie Nebel, both seniors, won the six-mile race after finishing in at 37:17. 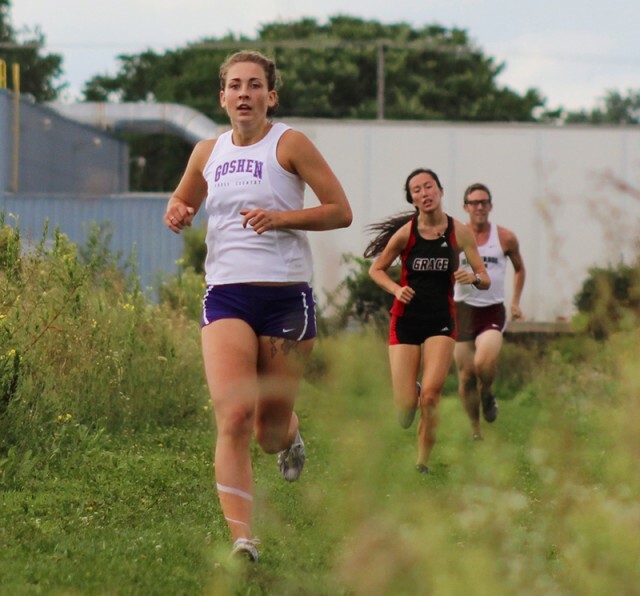 In addition to the number one pair, seniors Michelle Moyer and Anna Costanza, finished in fourth position after running in 40:09, while junior Natalie Graber and freshman Erin Bergen were ninth in 41:32. Cross Country coach, Doug Yoder, felt that the Hokum Karem went well. For Yoder, both teams will be better than last year. The goal for the men this year is to be in the top of the conference. Yoder said, “The men should be vying for the Crossroads League championship.” Meanwhile, the women also have great goals for this season. “For the women’s team we would like to be in the top half of the Crossroads League,” he said. The Goshen College Cross Country team has six days until the next meet, which will be the Indiana Wesleyan University Invitational. This event will be held Friday night in Marion, Ind.